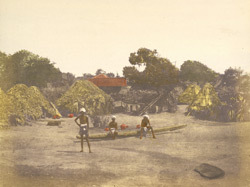 Photograph of scenery on the Coromandel Coast at Madras in Tamil Nadu taken by Frederick Fiebig in c.1851. The coastline is beaten by violent seas, especially during the north-east monsoon season from October until April. The type of local craft used is the catamaran or out-rigger canoe which was originally a raft of three or four logs lashed together and whose name comes from the Tamil words 'Kattu' (binding) and 'Maram' (wood).Little seems to be known about Frederick Fiebig. He was probably born in Germany and became a lithographer (and possibly was also a piano teacher) in Calcutta, publishing a number of prints in the 1840s. In the late 1840s Fiebig turned to photography using the calotype process, producing prints that were often hand-coloured. His photographs includes several hundred views of Calcutta in the early 1850s, one of the earliest detailed studies of a city, a large hand coloured collection of which were bought by the East India Company in 1856, their first major acquisition of photographs. Among the roughly 500 pictures were views of Calcutta, Madras, Sri Lanka, Mauritius and Cape Town.